We are truly grateful to have such wonderful friends and family. Each of you has touched our lives in significant ways. We are so excited and can’t wait to celebrate our special day with you in the magnificent city of Dubai on March 31, 2018. We appreciate the time you are taking to be with us and look forward to seeing you on the big day! Please come back and visit, as we will be updating the website with new details regularly! Jumeirah Al Qasr is situated on a private beach with extensive landscaped gardens, canal-style waterways and spacious rooms with stunning views over the Arabian Gulf. 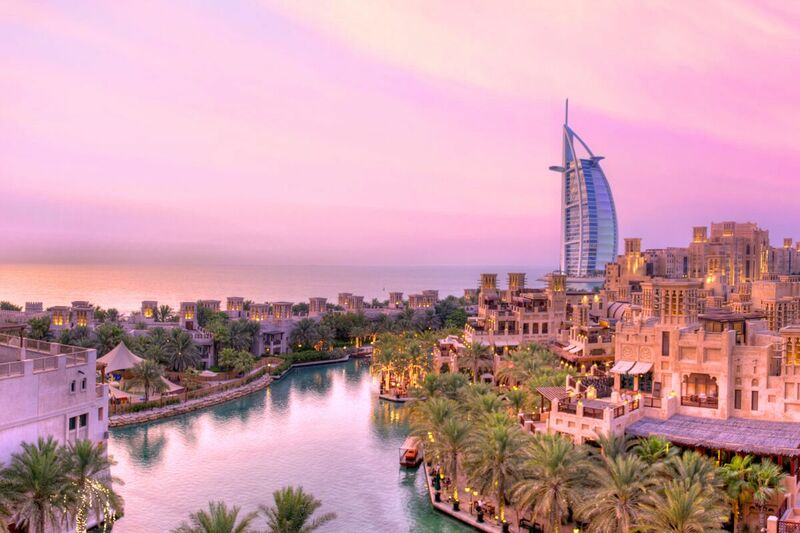 Jumeirah Dar Al Masyaf is situated amongst tranquil gardens, canal-style waterways and the resort’s private beach. All of the spacious rooms are decorated in authentic Arabian style. Jumeirah Al-Naseem is anchored on a stunning endless stretch of private beach overlooking the Burj Al Arab. The hotel is set in tranquil and peaceful surrounding with ultra-modern open plan rooms. Al Qasr, Dal Al Masyaf and Al-Naseem Hotels are conveniently located in the same resort as the wedding venue! We have reserved a block of rooms at the above Jumeriah Hotels exclusively for our guests on March 31st at a special discount rate. Please email us directly for details. Located on the world famous Palm Jumeirah, this elegant resort offers spacious rooms and suites with stunning panoramic views of the Arabian Gulf and 200 metres of private beach. Sofitel Dubai The Palm Resort & Spa is a Polynesian island inspired resort situated on the iconic Palm Jumeirah, 8 minutes walk from the beach. Located on Dubai’s iconic Palm Jumeirah Island, this remarkable Thai-inspired resort features private beach with idyllic views, 3 swimming pools and 4 restaurants. Set in the heart of Dubai Marina, the hotel features an outdoor pool, nine food and beverage venues and scenic views of the Marina. The beach at Jumeirah Beach Residence (JBR), is 10 minutes’ walk from the hotel. This 5-star Hilton resort is located on Dubai's The Walk at Jumeirah Beach Residence (JBR), offering endless shopping, dining and leisure activities. The hotel is set amidst beautifully landscaped gardens along a private beach. JA Ocean View Hotel is located in the lively seaside area of Jumeirah Beach Residence (JBR) in Dubai Marina, 6 minutes walk from the beach. The hotel is situated along The Walk and offers scenic views over the Arabian Gulf. Dubai Marina, Jumeirah Beach Residence (JBR) and The Palm Jumeirah are 10-15 minutes drive away from the wedding venue! We recommend these areas because they are located within close walking distance to the beach and offer a great choice in shopping, dining and leisure activities. If you prefer the experience of a luxurious city break, we recommend ‘Downtown Dubai’, which is in the heart of the city and a 30 minute drive away from the wedding venue! Downtown Dubai is where ‘Burj Khalifa’, the tallest building in the world is located. It is also home to the ´Dubai Mall´, the largest shopping mall in the world and the ‘Dubai Fountain’, the world's second largest choreographed fountain. In terms of accommodation, Downtown Dubai is host to some of the most iconic hotels the world including The Amarni Hotel, The Palace and JW Marriott Marquis. The best way to travel around Dubai is by Taxi or Uber. Dubai’s Taxis are available to hail nearly everywhere at just about any time, day or night and are reasonably priced. If you prefer a more comfortable and hassle free mode of transport, we recommend Uber. If it’s your first time using Uber, download the app here: https://www.uber.com/invite/nicholask7174ue to get AED 20 off your first ride. If you have any questions or require further information on accommodation and travel, please send us an email directly. Your presence at our wedding is the greatest gift of all. However, if you wish to honour us with a gift to help us on our way, Gift Vouchers from Mall of The Emirates would really make our day. Please respond before Sunday, December 31, 2017. Thank you! Simply fill out the text box below to let us know if you are attending our wedding, how many adults are in your party, and any information or queries you may have for us.